If you'll notice, most of my empties were my samples from different brands. 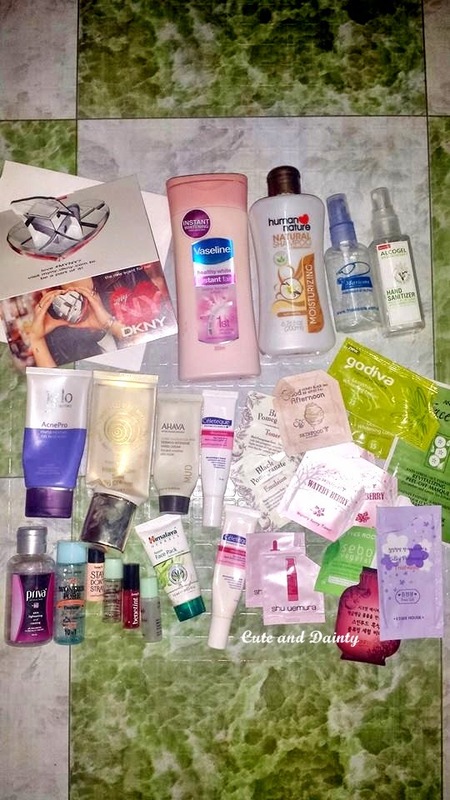 I'm actually trying to sort my beauty products few days ago when I noticed that my samples are building up so I pulled them out of my containers and started using them. It's actually good to use samples first before buying the full size because you'll get to know if the product suits your skin or not. Notice my Tony Moly Intense BB Snail Cream which I used until the last pump! I love it so much!!! After almost a year, it was emptied. I didn't imagine that I will used everything up. The tube was so big and the usage was so little that I didn't imagine it will be gone forever. Haha. Now, I am using another brand from Tony Moly again and will be reviewing it in a few days. As I don't use these products at all so i'm gonna recommend them to some of my girl friend,hope they will surely love them. These are already used products. There aren't anything familiar? I'm using a different deo since my pits are rather sensitive. There are a lot of familiar stuff here. I usually end up emptying my toiletries before getting a new one. I love Human nature natural shampoo, it gives a lot of volume to my hair, what a great way to make my hair soft and shiny! I have tons of grooming products. My skin is quite hypo allergenic and quite sensitive so I don't normally try every product that I am seeing. What I am using is my derma's approved skin care. I have a sensitive skin too but it's nice that it doesn't react to everything. I am also fond of collecting samples and trying them before buying the full size. You've been trying a lot of products! Yep! I am always on the lookout on what's 'perfect' for my skin. That's true. I think it's smart to try samples first than investing in beauty products that might not be a good match for you. True! You can also explore new stuff that's meant for you through samples. I actually use Coconut Oil for most things, its perfect as a moisturiser, after sun, hand and cuticle cream and even hair treatments. True! I agree with that. I am currently using beauty oils right now as my daily makeup remover and hair treatments too weekly. The only downside is that I feel hot when I use it. Maybe because it's summertime? Hmm.. Sample sizes are also a hype nowadays. Beauty fairs and events offer more sample sizes to try than giving full size ones. Where can I get those? They're new to my ears. I'm glad you actually finish your products! It's more environmental that way. I guess so. Samples really extend a lot of help when it comes to choosing. Uhm, it's so-so for me. I think the scent suits corporate women and the like. I envy you I tend to just buy and never finished it - except if I really like the product though I do like all of them lol..